Analysts from RBC, Deutsche Bank, and Monness Crespi & Hardt raised their target prices for Apple's stock this week to US$100 or higher. The changes follow Apple's 7-to-1 stock split on Monday and show analysts are positive overall about the company's growth potential. RBC raised its target price from $96 up to $100 with an "Outperform" rating. Monness is in line with RBC, raising its target price from $93 to $100. Deutsche Bank, however, thinks Apple will top the $100 mark and moved from $92,86 up to $105 with a "Buy" rating. Wells Fargo analyst Maynard Um set his target range earlier this week between $86 and $93, coming in below the likes of RBC, Deutchse Bank, and Monness. Citigroup is even less optimistic with an $82 target price and "Neutral" rating, up from $81.43. Apple had been trading well over $600 last Friday ahead of its stock split, and at its new adjusted price is still strong. The company's stock closed on Thursday at $92.29 and opened Friday morning at $92.18 with a $554.73 billion market cap. 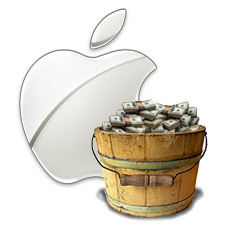 Apple is currently trading at $92.01, down 0.28 (0.30%).